Increasing the educational credentials of poorer Americans is one of the surest ways to boost social mobility. This is one reason the government subsidizes higher education in various ways. One subsidy recently in the spotlight is a provision under Section 117(d) of the tax code which allows colleges and universities to offer tax-free tuition waivers to graduate students. Republican Congressmen have the waiver in their sights. The House version of the Tax Cuts and Jobs Act would have changed the tax code so that tuition waivers would be treated as taxable income. Tax-free tuition waivers: what are they? Close to 145,000 graduate students (and 27,000 undergraduates) received nontaxable tuition reductions in the 2011-2012 school year. While the average graduate school tuition is over $16,000 per year, tuition can reach up to $24,000 at the University of Michigan, $26,000 at Duke University, and nearly $50,000 at MIT. But a full-time graduate student at MIT is likely offered a tuition waiver, in addition to a modest stipend to pay for her living expenses while pursuing her degree (often in exchange for a research or teaching assistantship). Thanks to Section 117(d), she only pays income tax on the stipend. Let’s say a student gets a full tuition waiver at a school costing $30,000 per year, and is living on a stipend of $25,000 a year. If the provision were to become law, his taxable income would go up from $25,000 to $55,000. As we go to press, the threat appears to be diminishing. The Senate version did not contain the provision, and it seems that it will not be in the compromise bill. But should it have been? After all, graduate students are very likely to be from affluent households, and often go on to be affluent themselves. Is the tax-free treatment of waivers a boost for social mobility, or yet another give-away to the upper middle class? Returns to advanced degrees have grown faster over the past several decades than returns to all other degrees. Adult men with a bachelor’s degree earned about 73 percent more in the first quarter of 2017 than those with a high school degree. But the wage premium for men with an advanced degree is 122 percent. Figures from the Hamilton Project for all graduates shows the post-graduate bump clearly. Who would pay for the Tax Cuts and Jobs Act? The share of jobs requiring post-graduate credentials is also growing. Scholars from the Georgetown University Center on Education and the Workforce expect that there will in fact be a rising deficit of graduates needed to meet the growing demands in the workforce. They estimate that the fastest-growing occupations will strongly favor workers with college degrees, and even more so they will be biased in favor of workers with advanced credentials. Postgraduate education: class stratifier or class equalizer? What does this mean for the perpetuation of inequality? The answer presents a paradox. On the one hand, advanced degrees are disproportionately pursued by students from relatively well-off backgrounds. Given the high returns to advanced degrees, graduate school can be seen as yet another way in which the upper-middle class transmits advantage to the next generation. But this is a little too quick. The main reason that postgraduate education is so skewed towards those from affluent backgrounds is that undergraduate education is so skewed. The four-year college completion rate of the richest family income quartile is five times higher that of the poorest. But among those who have attained a bachelor’s degree, the odds of enrolling in graduate school are only very slightly higher for those from families in the top compared to bottom quartile (45 percent versus 39 percent). A similar story can be told about race gaps at different stages of post-secondary education. Only 8 percent of the black (non-Hispanic) population aged 25 or older held an advanced degree in 2015, compared to 14 percent of the white (non-Hispanic) population and 21 percent of the Asian population. But again, these differences reflect the inequalities seen at the undergraduate level. 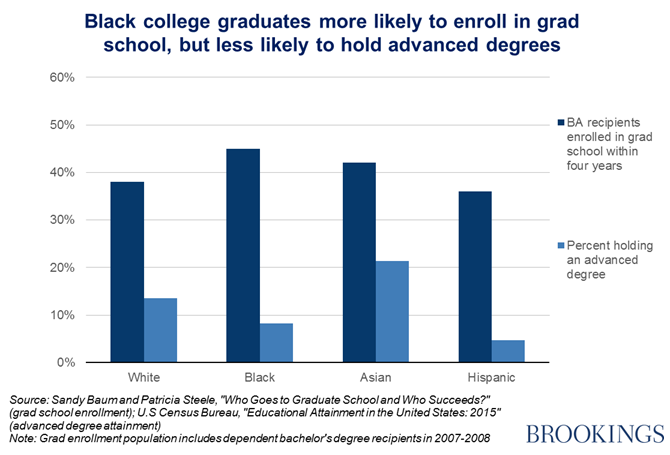 Among bachelor’s degree recipients, black graduates are actually slightly more likely to enroll in graduate school than other groups. 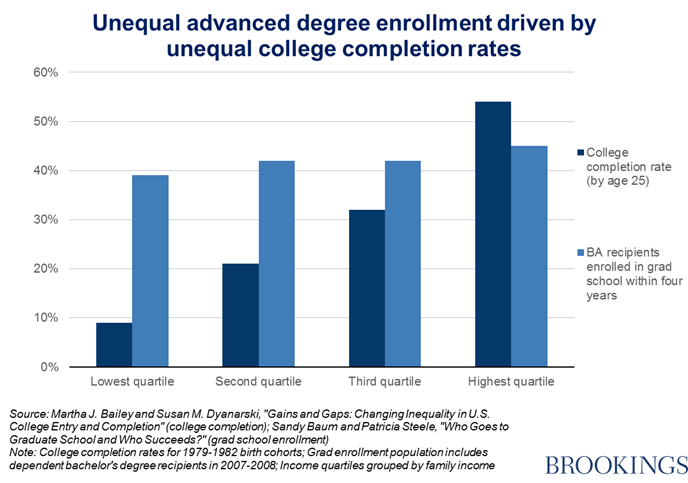 Promoting upward mobility requires equalizing access to the highest-return credentials. Right now, the biggest bottleneck is in undergraduate education, and especially in acquiring a BA. Class gaps in postgraduate qualifications reflect class gaps in undergraduate ones. Increasing low-income and minority representation in graduate school will mean addressing the various barriers to entry existing much earlier in the educational pipeline. This will require investment, which means raising additional revenue. Who should pay? 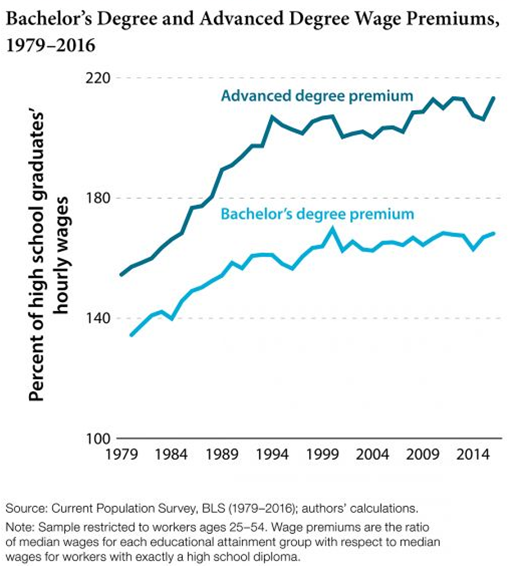 Higher earners – many of whom have graduate degrees. The people who get economic benefits from a higher education can fairly be asked to pay more back into the system: just not while they are still in it. In the absence of government support like the tuition waiver tax deduction, young adults from upper-middle-class families might be able to rely on family support to advance their credentials, but those from poorer backgrounds would likely have more difficulty. This could undermine the relatively egalitarian pattern of graduate school enrollment for those with college degrees. If nothing else, perhaps the GOP proposal will draw attention to the deep inequities in the higher education system – and to better solutions.